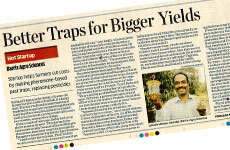 Better Traps for Bigger Yield. Rallapali Jaganatha Reddy, is one of 15,000 farmers from across rural Andhra Pradesh, Tamil Nadu and Karnataka, who testifies about the immense savings Barrix products has provided him, by replacing costly pesticides for his pest management needs.G Srinivas, a governmental agricultural officer also agrees that Barrix products help reduces 50% damages in Mango plantations. Founder of Barrix Agro Sciences Pvt. Ltd., Mr. Lokesh Makam, shares his experiences while entering the Agri business sector, the current mindset prevalent in the sector and how we want to create a positive change.